The nominations for the 2017 Turkish Airlines Cricket Ireland Awards have been announced with Munster nominees in three categories. After an exciting season in club cricket across Ireland, three clubs have been shortlisted for the Tildenet Club of the Year Award and they are Waringstown CC, Ballyspallen CC and Limerick CC. Limerick will be aiming to keep the award in Munster after Cork County clinched it in 2016. Recognising the incredible hard work that has been achieved in the area, this year sees the introduction of a new category, the Notts Sports Groundsman of the Year. The inaugural nominees are Dale McDonough, Matt Reed and Trevor Hamilton. Matt is being recognised for his efforts in producing some high quality wickets at the Mardyke at both club and provincial levels as well as maintaining the iconic grounds. Scorers Andrew Mooney and Mary McElwee have been nominated in the IAA Official of the Year category along with umpire Gerard O’Sullivan. Gerald has been a stalwart of the Munster Umpires Association and Cricket Committee for a number of years and has been instrumental in helping to improve umpiring standards and modernising the regulations for the sport in Munster. 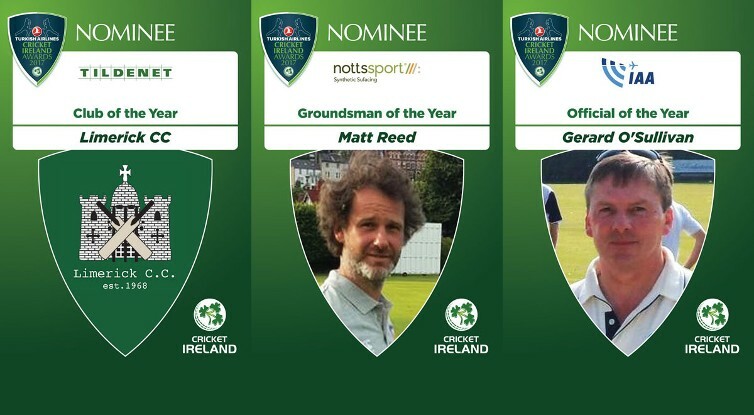 The winners of all the awards will be announced at the Cricket Ireland Awards on the evening of Friday, 17th November, in Smock Alley Theatre, Dublin, with live updates on Twitter @irelandcricket throughout the event. Best of luck to all three Munster nominees! Turkish Airlines Men’s International Player of the Year: Kevin O’Brien, William Porterfield, Paul Stirling. Hanley Energy Women’s International Player of the Year: Gaby Lewis, Rachel Delaney, Isobel Joyce. The Sunday Independent Aengus Fanning International Emerging Player of the Year Award: Jacob Mulder, Aoife Beggs, Rachel Delaney. Hanley Energy Inter-Pro Player of the Year: George Dockrell, Kevin O’Brien, James Shannon. Flogas Male Youth International Player of the Year: Harry Tector, Josh Little, Graham Kennedy, Mitchell Thompson. Devenish Female Youth International Player of the Year: Gaby Lewis, Orla Prendergast, Amy Hunter. Shapoorji Pallonji Female Academy Player of the Year: Lara Maritz, Leah Paul. Notts Sports Groundsman of the Year: Dale McDonough, Matt Reed, Trevor Hamilton. IAA Official of the Year: Mary McElwee, Gerard O’Sullivan, Andrew Mooney. Clear Treasury Coach of the Year: Julie Logue, Kamal Merchant, Ryan Eagleson. Toyota Super 3s Player of the Year: Kim Garth, Laura Delany, Mary Waldron. O’Neills Club Player of the Year: George Dockrell, Nigel Jones, David Rankin. Tildenet Club of the Year: Waringstown CC, Ballyspallen CC, Limerick CC. Oasis Volunteer of the Year, in honour of Derek Scott; Cricket Writer’s of Ireland Hall of Fame Award and Gibney’s Outstanding Contribution to Irish Cricket, in honour of John Wright to be announced on the night.